The one features that everyone is still waiting for on oscillating tools, is tools-less blade change. Fein, the originator of the tool has had this feature for a few years now, but at this point, Fein and Porter-Cable are the only ones with the tool-less blade change feature. 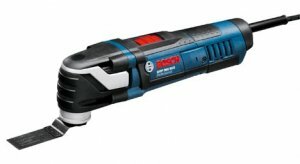 Now it looks like Bosch Germany is releasing a tool-less oscillation tool of their very own. This is good news if the tool eventually makes its way to the US, but that can only happen if it doesn't violate any current patents. It likely doesn't violate any Fein patents, or else it would not be available in Germany, but patent laws are different in each country. We can't exactly see how the tool-less feature works on the Bosch GOP 300 SCE Professional, but we can see a lever on the left side of the tool that hints at its function. The tools uses the Bosch OIS blade standard, which means the blade can not be simply pulled forward. So the system might be less like the one Porter-cable uses, and more like what Fein uses. Either way, we will be keeping our eyes out for this one.